Be sure to check the size chart if you view a different item because the sizes will vary. If we make a mistake we want to fix it and we hope you will give us the opportunity to do so. Alaska / Hawaii /. Kylo Ren Darth Maul Sidious Sith lightsaber prop hilt set. Kylo machined to hold 1” blade. Kylo includes Working LED Crystal Chamber. Maul and Sidious machined to hold 7/8” blade. A great prop set at a great price. 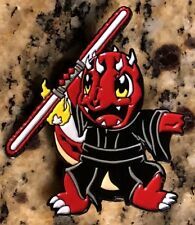 Enamel Pin Darth Maul “CharMaul” Charmander Star Wars Pokemon mash-up 2” Custom design by tattoo artist and Geeksterink Legend Boss Tom. Not available anywhere else! See my other listings for additional pins and stickers, may the Force be with you catching them all! 80 in. Extended. Scratches and stains tube has a dent. The centerpiece that holds both lightsabers together does not detach when you press the button. Batteries are not included. Please study pictures for condition. Check out my other lightsabers! If you have any questions please feel free to contact me thank you! Up for sale is a Collector Challenge Coin of Darth Maul. The front is an image of Darth Maul's torso falling down after his duel with Obi-Wan Kenobi. The back has an image of his legs. You are purchasing 1 coin. WARNING: CHOKING HAZARD! This product poses a significant CHOKING HAZARD to small children. It is an 'out-of-production' item manufactured nearly 20 years ago, and might not adhere to current toy safety laws, and/or production standards. Rare Star Wars Episode I Darth Maul Lightsaber. Extends to over 5 feet in length. Lights up! Battery operated and requires 4 AA batteries not included. Star Wars Episode 1 Darth Maul (Tatooine) with cloak and lightsaber 1999. Cardback is in great condition. Collection 1 asst no 84085/ no 84134. Star Wars 1999 Episode I Darth Maul & SIth Speeder 12"
In Great Box. Item sold as is. I will give as much information as I can. This is a genuine collection and I hate to part with it, but I need the space. I can provide more pictures if necessary. Complete with all accessories and in excellent condition. RARE AND HARD TO FIND! RELEASED IN 2004 AND LONG SOLD OUT! STILL FACTORY SEALED TAPE ON THE PLASTIC COVER OF THE LIGHTSABER! THE BOX IS IN GOOD CONDITION BUT MAY SHOW SMALL SIGNS OF SHELF WEAR DUE TO STORAGE AND AGE! This Pin is in MINT condition. STAR WARS THE EXHIBITION BRUSSELS EXCLUSIVE! RELEASED IN 2008 AND LONG SOLD OUT! ONLY 2500 MADE AND THIS IS A RARE PROMO EDITION! HARD TO FIND! THESE MINI BUSTS ARE ROUGHLY 6" TALL! TOYHIDEOUT IS PROUD TO PRESENT . 1:1 SCALE! ARTIST PROOF! VERY RARE AND HARD TO FIND! RELEASED IN 2003 AND LONG SOLD OUT! THE LIGHTSABER WAS LOOKED AT BUT NOTHING HAS BEEN TOUCHED, STILL FACTORY PLASTIC WRAPPED FROM MASTER REPLICAS! Their Art Boxes are sealed and in mint condition. The Dark Warrior is displayed in a detailed flap cover, windowed display art box. Where Darth Sidious is shadowy and elusive, his scarlet and pitch-tattooed apprentice is a vivid manifestation of Sith rage. Now you too can craft this beautiful Lightsaber! This includes sanding, painting, and gluing. Instructions are included. One Darth Maul Lightsaber Kit. This kit is printed out of high quality PLA plastic. Star Wars Darth Maul Episode 1 , 12" poseable Figure, Hasbro 1998. This figure is in very good condition. I am selling this loose with partial accessory and no box. Showing box in photos but not included. ~DARTH MAUL WITH BLOODFIN~FULL STATUE~. The Darth Maul with Bloodfin Statue was hand cast in high quality polyresin, then hand painted & finished to exacting standard which Gentle Giant Ltd is famous for. YOU ARE BUYING THE NOW RELEASED STAR WARS 'DARTH MAUL' SPACE PUNCH SPARKLING VITAMIN DRINK NEW CAN~! WE HAVE ALL 12 OF THE STAR WARS DRINK CANS LISTED~ LET US KNOW IF YOU WANT CERTAIN CANS~. WE HAVE ALL 12 OF THE STAR WARS CANS AVAILABLE AND LISTED~. 2019 Star Wars Celebration Chicago Exclusive DARTH MAUL T-SHIRT Medium (M) New!! Unisex shirt. 2019 Star Wars Celebration Chicago. Never washed. See all pics for condition.What you see is what you get. Darth Maul Light Saber. Sealed, Unopened. 2005 COLLECTORS SOCIETY EXCLUSIVE! RARE AND HARD TO FIND! RELEASED IN 2005 AND LONG SOLD OUT! THE BOX IS IN GREAT CONDITION BUT MAY SHOW SMALL SIGNS OF SHELF WEAR DUE TO STORAGE AND AGE! A MUST HAVE FOR ANY STAR WARS FAN! Star Wars TPM Darth Maul Container Bust, Applause, Exclusive 1999. Condition is New. Still has manufacturer seal. Shipped with USPS Priority Mail. Condition is Used. This mug is not in new condition but looks great! Star Wars Celebration 2019 Darth Maul Lightsaber Lanyard Exclusive From.... Condition is New. Shipped with USPS Priority Mail. DARTH MAUL LIGHTSABER 5 FT. Double Sided Star Wars Episode 1 The Phantom Menace. Condition is New Old Stock. (Never Opened) Creases on the corners of the packaging. (See Photos) Shipped with USPS Priority Mail. From recent Chicago event Star Wars Celebration 2019 Hasbro Darth Maul 20th Anniversary Exclusive. It is hard to see. See picture of this small detail. Star Wars: Darth Maul Double Bladed Lightsaber - Force FX Edition - BOX ONLY! BOX ONLY!Box for Star Wars: Darth Maul Double Bladed Lightsaber - Force FX Edition - BOX ONLY! Condition is New. Disney Elite Series Die Cast. Date Stamp Joint Count: 14. Scale: 6.5". Darth Maul Lightsaber Adapter Connection Coupler Hasbro Master Replicas NEW! !